When describing National Hockey League player Theo Fleury, “vulnerable” is not the first word an observer would use. Fleury is five feet, six inches tall, and he made it to the pros by aggressively — and sometimes violently — compensating for his size. At 19 years old in 1987, he started one of the most famous fights in junior hockey history, sparking a bench-clearing brawl between Canada and the Soviet Union that disqualified both squads from the world championship. In the NHL, he spent over 2,000 minutes sitting in the penalty box. Once, in 1999, a stick to the mouth knocked loose a few teeth and soaked his uniform with blood. A fan tossed his own autographed Fleury jersey toward the bench as a replacement; Fleury grabbed it and pulled it on, then turned to face the crowd, waiting for a cheer of approval. For many hockey fans, that’s the player they’ll remember: grinning back at his fans through the glass, blood dripping down his chin, about a light year away from vulnerable. But that’s the word that came to mind two decades later, when Fleury took the microphone at Kaplan Arena Wednesday night and looked out at the crowd of William and Mary athletes. “20 years ago, I had a fully loaded pistol in my mouth, ready to pull the trigger and end my life,” Fleury said. Fleury already knew how that start was going to go over in the college crowd. He expected the tense, anticipatory stillness. He has been telling his story to schools across the United States as part of a tour with We’re All a Little Crazy, a group dedicated to ending the stigma surrounding mental health in college athletes. After an application was submitted by Tribe Athletics, the College was selected as one of 15 schools on the tour route. Following stops at James Madison University and the University of Richmond, Fleury and the rest of the group — all with former high-profile careers — came to Williamsburg to give their talk. But sometimes athletes can’t get through it — at least, not on their own. That’s what Fleury and the rest of the team look to impart in their presentations, especially for students in the high-pressure environment at the College: it is okay for them to ask for help, and they are not the only one who needs it. Fleury played over 1,000 games in the NHL. 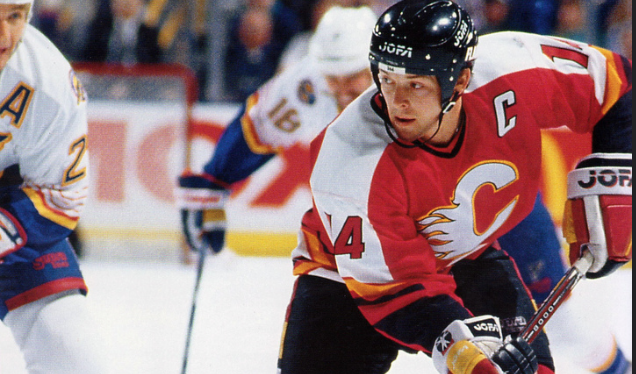 In 1989, he won the Stanley Cup with the Calgary Flames. In 2002, he won an Olympic gold medal with Canada. Toward the end of his career, however, he became known less for what was in his trophy case and more for the off-ice brawls and substance abuse that got him kicked out of the NHL in 2003. In 2009, Fleury published an autobiography, “Playing with Fire,” describing the abuse and mental illness that sent him careening down a dead-end path of alcoholism and drug addiction. When he first wrote the book, he just wanted to get the story off of his chest. But run-ins with readers who were eager to thank him for sharing it taught him an important lesson: he wasn’t alone. Other people desperately wanted to know that they weren’t the only ones who battled with their own mind. Kussin, whose career in professional sports league offices was cut short by post-traumatic stress disorder, reached out to Fleury on LinkedIn one year ago and asked if he wanted to form a group to promote normalizing mental health care. Fleury, who already knew the impact the story of his recovery could have, said yes. Now, the We’re All a Little Crazy panel includes everyone from professional boxers to Olympic skiers to competitive eaters. The presenters want to help athletes understand that a healthy mind is just as important as a healthy body when it comes to excelling in their sports. For Tribe athletes, some of whom are eyeing professional training camps at the end of their time on campus, there is no greater motivation. In order to make sure student athletes have the tools to do so, part of the tour is dedicated to teaching the audience simple breathing and meditation techniques. Another segment makes sure students are aware of the resources available to them at the College, which recently expanded its mental health services into the new McLead Tyler Wellness Center. The building, sunlit by windows that look onto the nearby Wildflower Refuge, was designed to calm racing minds. Those resources are something that Fleury is happy to promote. If there’s one thing he would have liked to have access to when he was a college-aged athlete struggling with mental health issues, it would have been places like the Wellness or Counseling Centers. Bringing this tour to campus is not the first initiative Tribe Athletics has introduced to promote mental health for College athletes. Earlier this year, the school hosted Derek Greenfield, a motivational speaker who focused on mental health in workshops for coaches, staff and student athletes. In 2016, Tribe Athletics invited former first overall Women’s National Basketball Association draft pick Chamique Holdsclaw to come present her movie, “Mind/Game,” which chronicled her struggle with and recovery from mental illnesses. This trend isn’t unique just to the College but is being echoed in collegiate athletic programs across the country. After a 2015 National Collegiate Athletic Association report revealed that only 10 percent of mentally ill student athletes seek help, as opposed to a third of college students overall, the league has been highlighting a focus on mental health in sports. Tribe Athletics has followed suit. Programs like this tour hope to slowly chip away at the stifling stigma that forced Fleury to internalize his struggle and cut his career brutally short all those years ago. Today, Fleury has gone from not being able to tell a soul about his suffering to sharing his story with crowds in college arenas. He recounted to Kaplan Arena the details of what he went through — the number of times he endured abuse, the $5,000 in cash he’d pocket every time he left the house because he never knew where he’d end up after his first drink, the way the gun tasted as it rattled against his teeth — with disarming bluntness. It can be hard for audience members who knew him solely for his hockey highlights not to be shocked by the weakness he exposed Wednesday night. But by the time Fleury told the crowd the date of his last drink — Sept. 18, 2005 — they knew what they were seeing wasn’t weakness. Being vulnerable requires toughness, and that is exactly what Fleury and the group hope to prove to the athletes and staff members in the Tribe Athletics program: that finding to the courage to seek help when you need it is a strength an athlete can train for.